The gullwing KV7 concept has design cues for the Sedona minivan replacement. 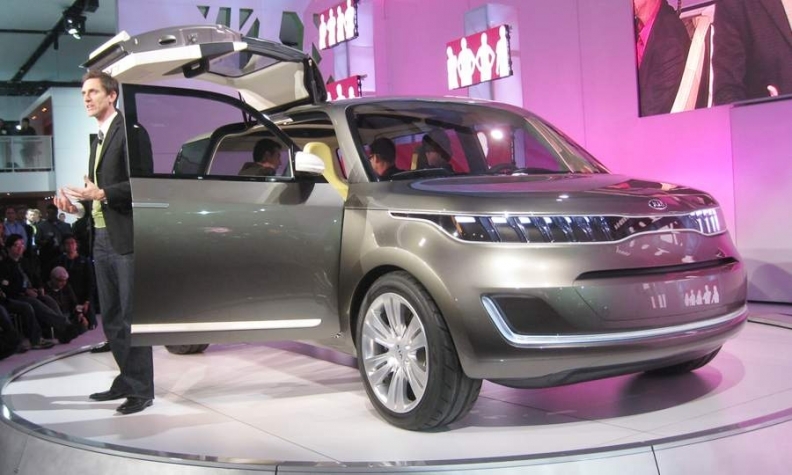 Kia offered a fresh, funky take on the minivan with its cube-shaped KV7 concept. The gullwing concept, a product of Kia's U.S. design studio, is dubbed a “modern-day activity van” by the company. Kia said many of its design concepts have served as the basis for production vehicle designs. The KV7's dimensions suggest it is an imagining of a Sedona minivan replacement. Inside, the KV7 has four swiveling seats, including the driver's seat. To make the instrument panel easier to reach, the entire dash moves forward six inches toward the driver when the car is started. The KV7 has several storage compartments and a flat-panel touchscreen computer is installed in a rear table. Under the hood, the concept has a Theta II 2.0-liter GDI turbocharged engine producing up to 285 horsepower.